There is no doubt that Curtain-Tracks has some pretty cool products, but the combination of 3120, 7140, and 7142J is a luxurious trio that is equivalent to the little black dress. It’s a necessity for every woman’s closet, but when worn correctly, can be a huge “wow” factor. 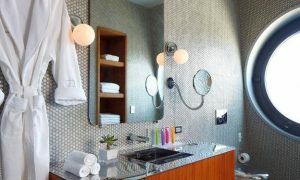 Curtain-Tracks’ products have been featured in upscale hotels because they are, well, upscale. Not only do they look great when installed, they work great, too. Being upscale includes talking with ten cent words, right? Well, how about adding “anodized aluminum” to your vocabulary? Our 3120 Extra Heavy Duty Track has been coated with a protective film that reduces the chance of corrosion. Casually slip that into your next conversation with a chemist at the hotel bar, and you’ll have instant credibility. This anodized aluminum makes the 3120 the perfect choice for your luxurious bathroom. Once installed, you’ll never have to worry about it again. It will look sleek because it comes in silver or black, and it will never rust nor corrode. Upscale. Luxurious. Functional. While a standard shower curtain rod and rings are sufficient, they can sometimes be frustrating to open and close - not very luxurious. What is luxurious is the sound of metal on metal and the easy swing of the shower curtain. The combination of 7140 Large Double Wheel Carrier and the 7142 Stainless Steel Curtain Hook creates function and style that just can’t be beat. Neither will rust nor corrode, and both are strong, simple additions to the most upscale showers. Add a cashmere hounds tooth shower curtain with grommets, and the room is complete. This trio of products has been used in upscale New York City hotels such as Dream Downtown, as written about in our previous blog post. Doesn’t this make you want to create your own upscale space?